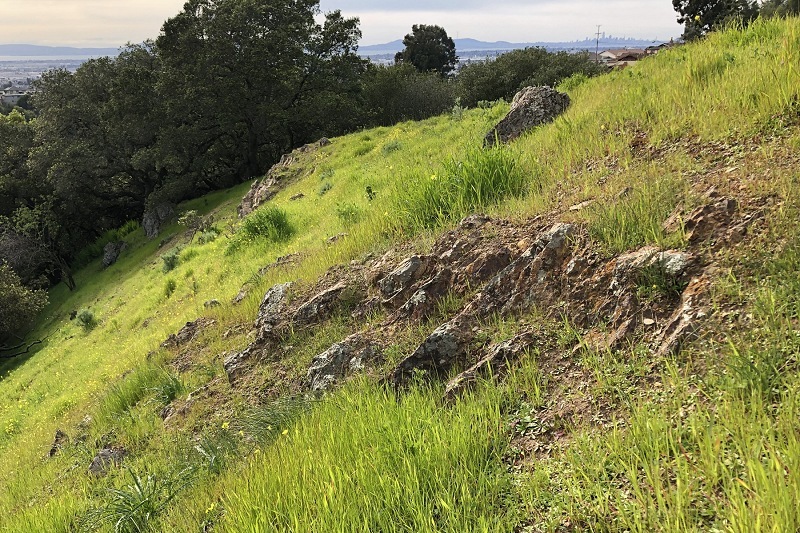 Before Europeans came into this country, the locals treasured the ocher deposits in the East Oakland hills. Ocher is the name for a variety of clay-like, iron-rich minerals with a color range from yellow to red to brown. For tens of thousands of years, we’ve used ocher as pigments and preservative coatings. Some cultures would bury their dead in it. 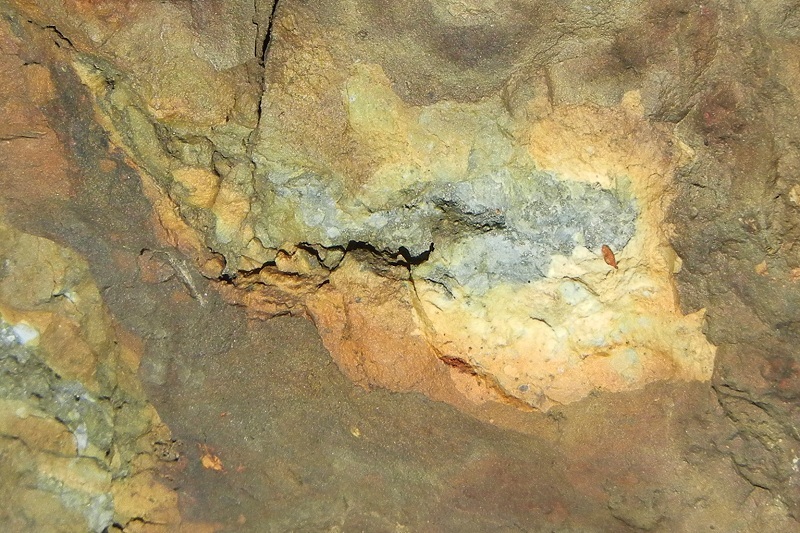 Our ocher deposits formed exclusively in the Leona volcanics, because that body of rocks was permeated with pyrite by hydrothermal springs as it rode on the seafloor toward North America, back in the Late Jurassic. 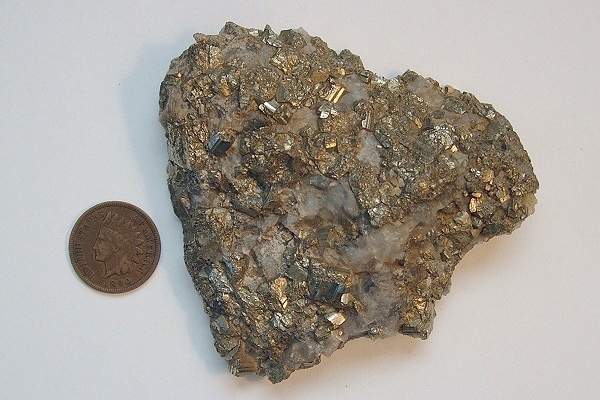 Pyrite is pure iron sulfide (FeS2) and looks like this. You can get nice crystals of it at any rock shop. 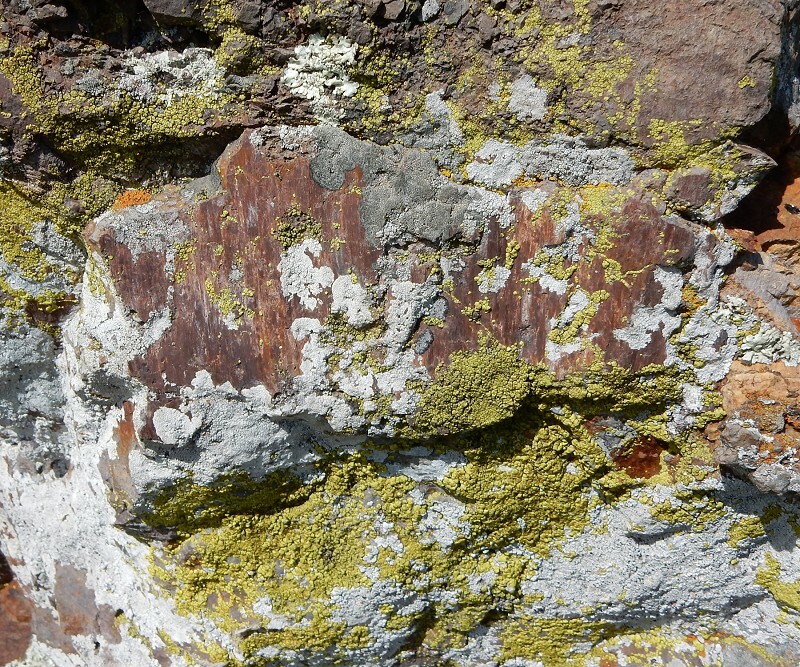 In the Leona volcanics, you’ll sometimes see pyrite in fresh exposures, like this roadside boulder along Campus Drive. It’s gray because the crystals are so small. 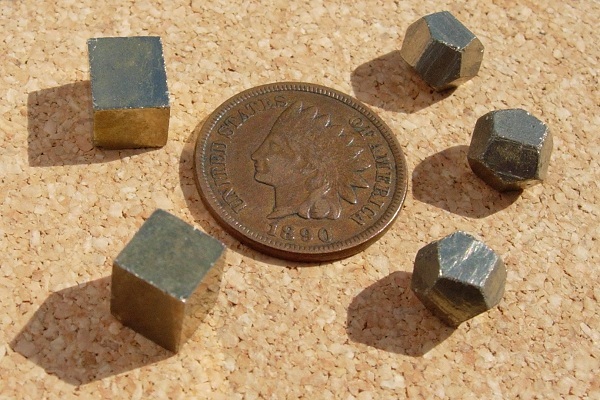 Oxygen, in air or in water, breaks pyrite down. The sulfur turns into sulfuric acid and leaches away while the iron oxidizes into a range of minerals on the ocher spectrum. 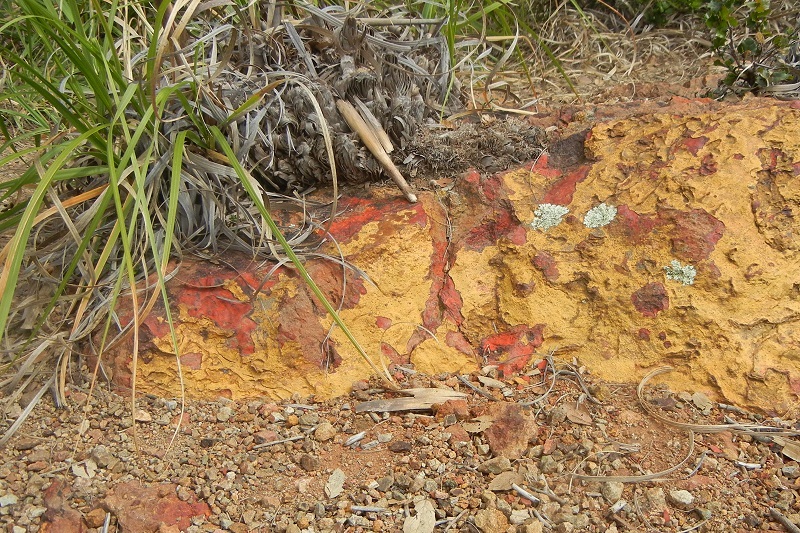 This process reliably turns the surface of the Leona orange and red, like here in the former Crusher Quarry. 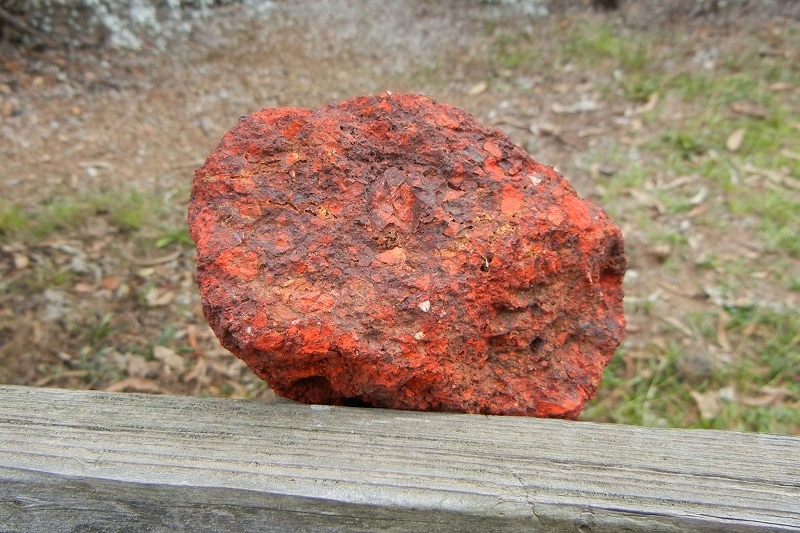 Pure, straight iron oxide (Fe2O3) is the mineral hematite, or red ocher. It can look black, but when powdered it turns the lovely color shown on the streak plates. Between pure FeS2 and pure Fe2O3 is a range of hydrated iron oxides that form ochers of different colors. 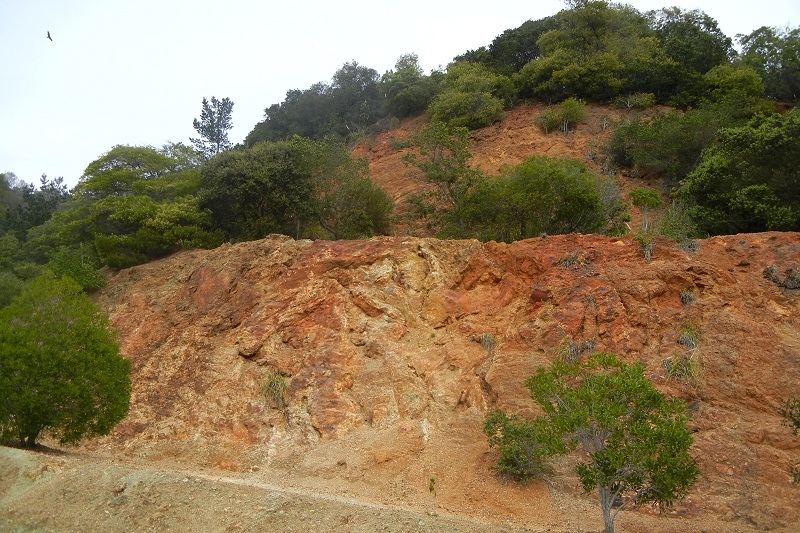 The roadcut on lower Redwood Road, at the site of the former Alma Mine, shows off some of them well. Here’s a hematite crust, which is right near a piece of concrete pavement that’s eaten out by acid. And here’s a beautiful brown crust. Most likely this is goethite (“GUUH-tite”), or brown ocher or sienna, an iron oxyhydroxide with the formula FeO(OH). 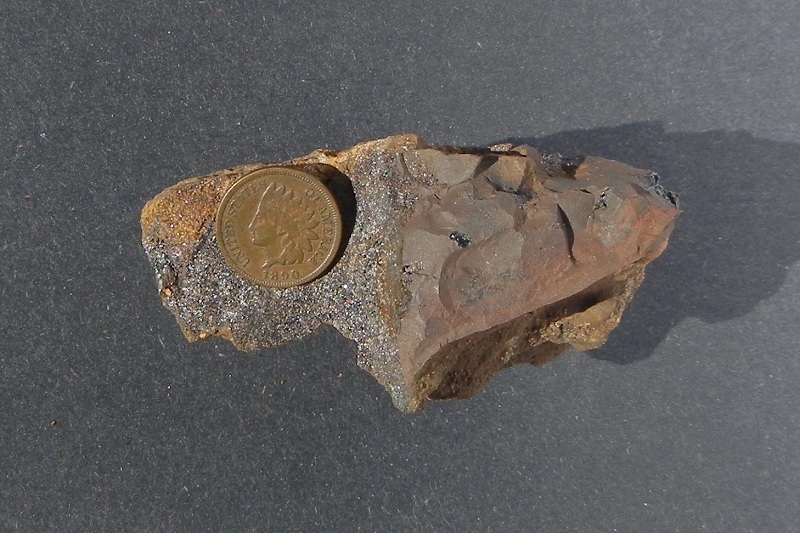 Here’s a specimen I collected in Wisconsin, with a glittering crust of hematite on it. Yellow ocher has even more water associated with it — the formula is FeO(OH) · nH2O. That’s what I would call this crust in the Crusher Quarry. There are wild cards in this scheme, namely manganese oxides and jarosite. Manganese oxide, the mineral psilomelane (“sigh-LOW-ma-lane”), is black. Just a few percent turns ocher into umber. (So does carbon.) Jarosite is a hydrated iron sulfate that can form if some of the sulfur lingers instead of turning to acid. It has yellow to brown colors. So really good ocher, in chunks worth the effort of digging, is hard to find. 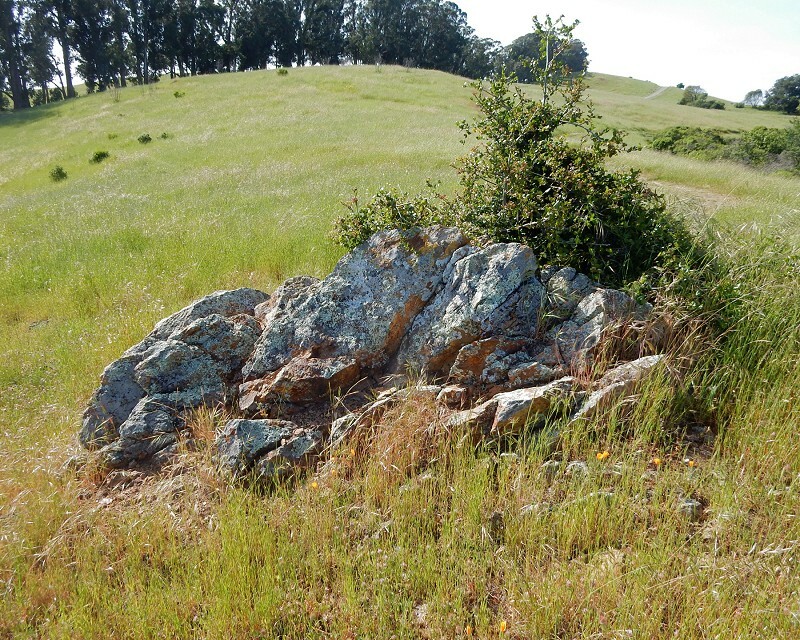 Oakland once had a large body of it that had slowly gathered on top of the Leona volcanics as the rock beneath was etched away by acid. 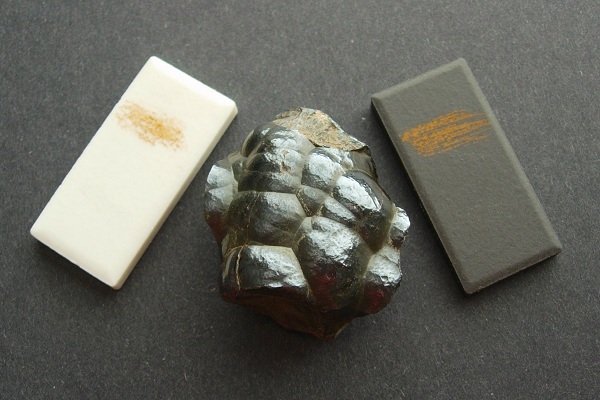 Such an iron-oxide cap is called a gossan. A little bit of the deposit is preserved on the Holy Names University campus. 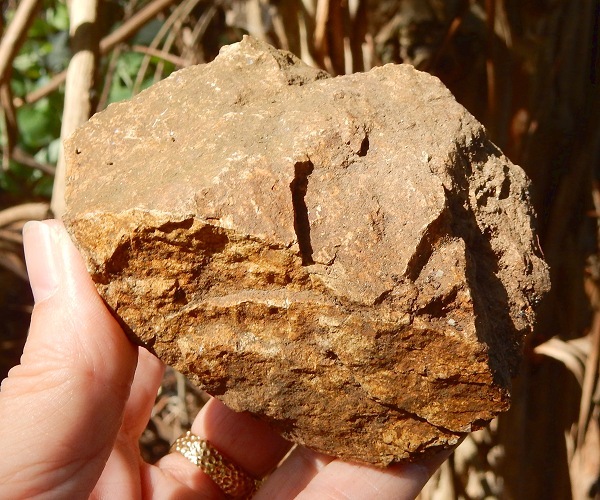 All of these ocherous minerals are important ingredients in soil, especially in dry regions. Rarely are they pure, though. Oakland’s ocher patch was the center of a widespread trade, back in the day. 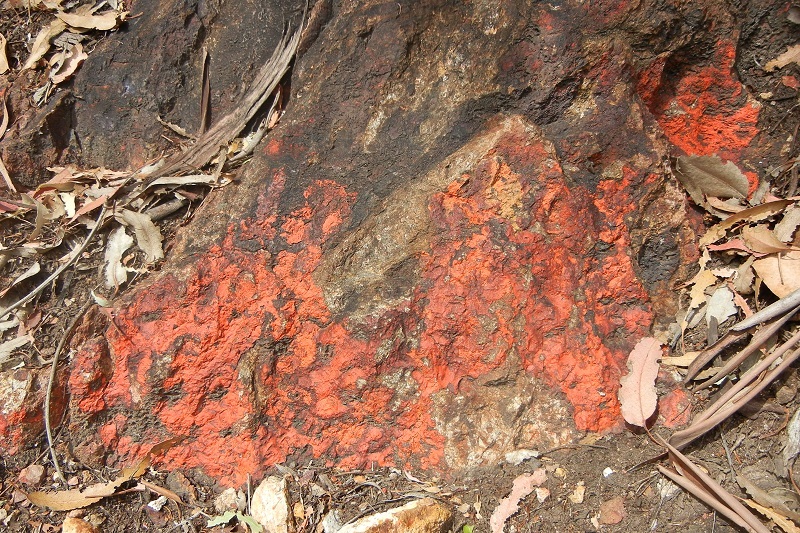 But in the late 1800s, Americans mined it out and turned it into red paint. The second geology ramble — my name for a long walk that starts in one place and ends in another — is a long and rugged one, just to show you I’m not kidding about these. 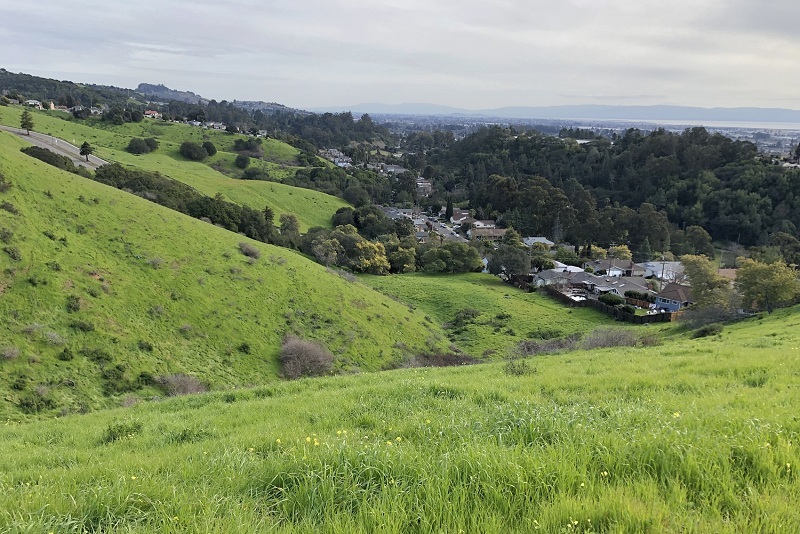 From the Rockridge BART station to the Orinda BART station is a walk of more than 9 miles with a thousand-foot climb in the middle. There are several ways to do this. 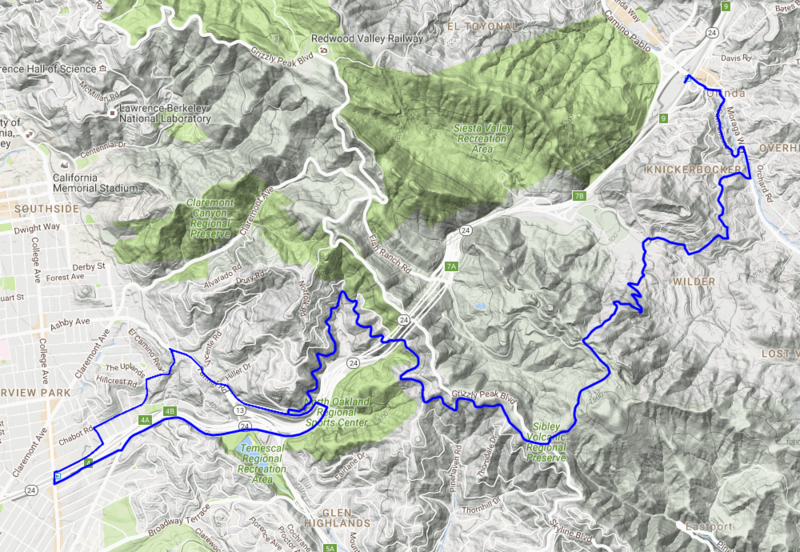 This summer I’ve pioneered what I’ll call the middle route on two separate outings. 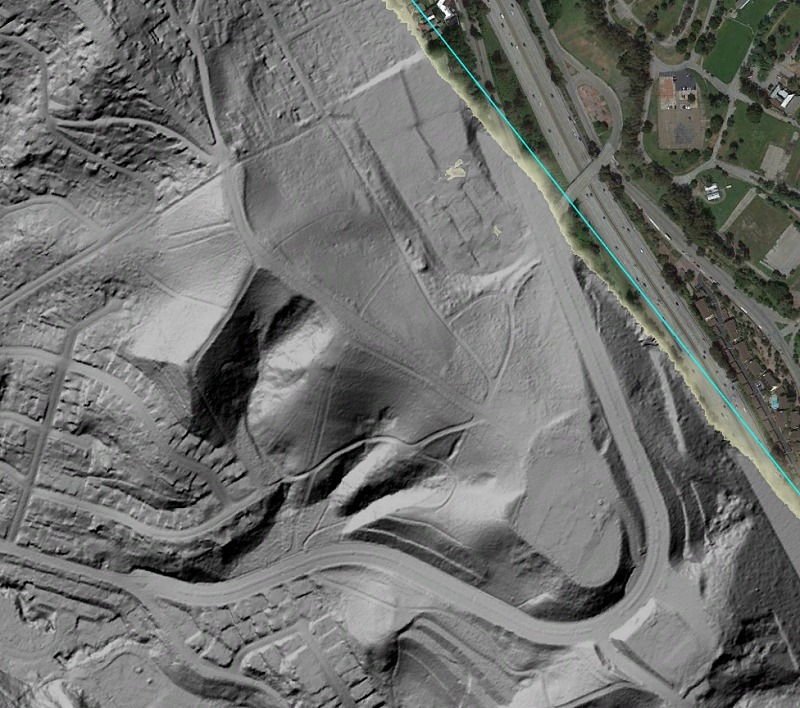 Here they are, first on Google Maps and then on the geologic map (both images are 1000 pixels). The photos are a mixture from both traverses. 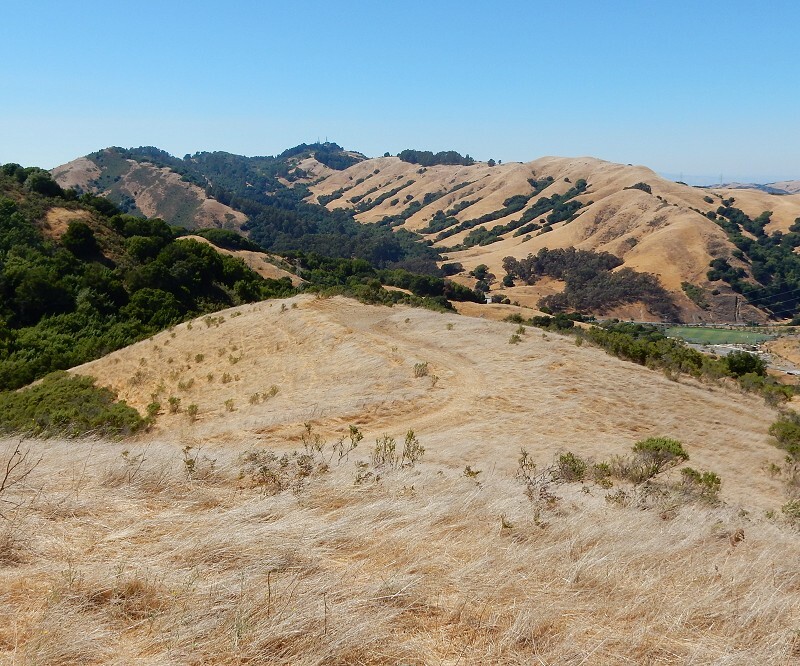 From the Rockridge station, the route along the south side of Route 24 is more direct while the alternative, up Chabot Road to Roanoke Road to The Uplands to Tunnel Road (dashing across Tunnel to the uphill side), takes you through more shade and past more rocks, starting on Roanoke. 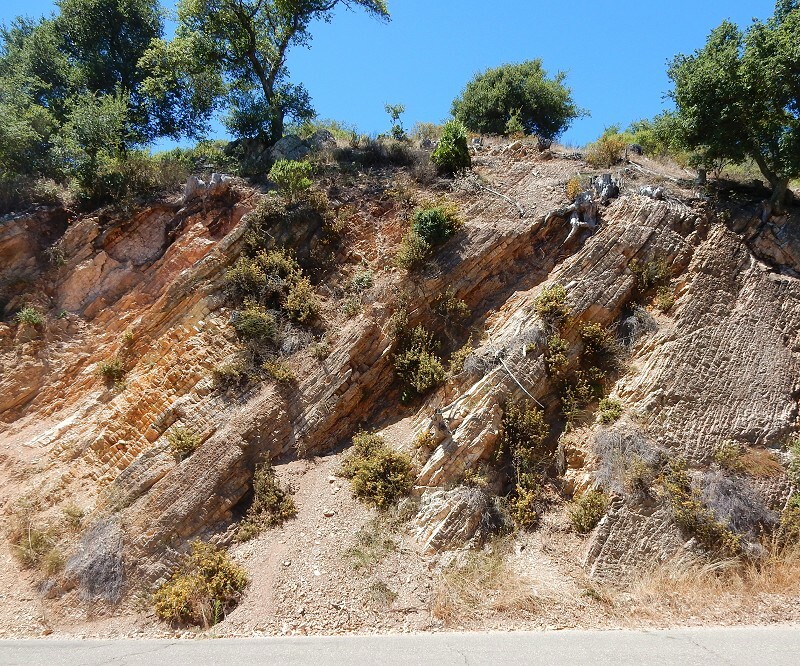 The mixed lithologies of Franciscan melange (KJfm) give way to rugged outcrops of the Leona volcanics (pink color) as you cross Vicente Creek on Tunnel Road. Admire them at the century-old estate called The Rocks. Beyond the Fire Garden is a short stretch without sidewalks that passes a long, excellent exposure of Leona volcanics. This was quarried in the 1930s and again in the 1950s during construction of upper Broadway, the Caldecott Tunnel and Route 24. 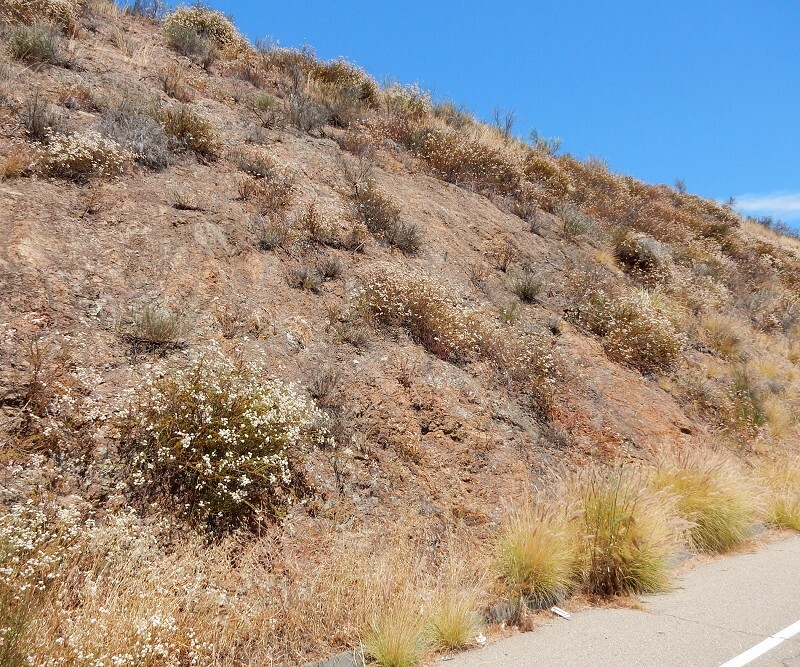 The rocks change to mudstone of the Great Valley Sequence (Ku), then the much younger Sobrante Formation (tan color), as you ascend Tunnel Road’s steady, gentle grade. 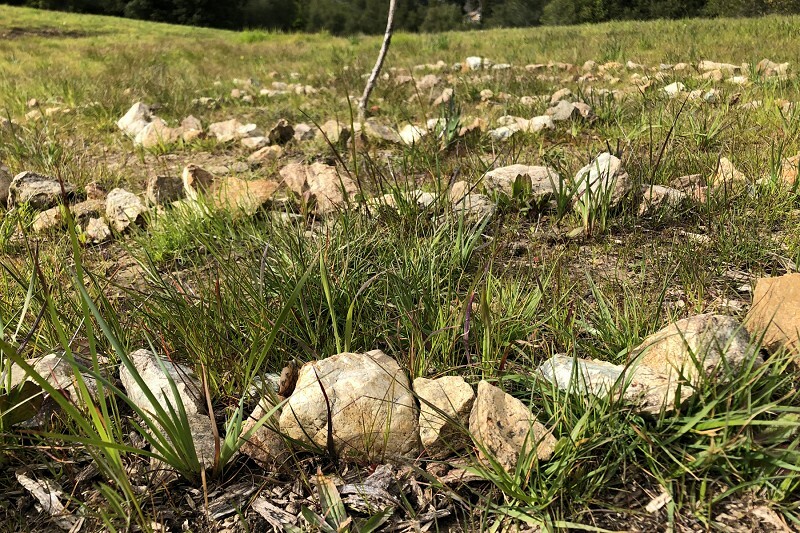 The change to the Claremont chert is dramatic as you near the ridgetop and enter Sibley Preserve. Cross the park on the Round Top Loop trail, which goes through the coarse-grained sedimentary rocks of the Orinda Formation (Tor), although you won’t see much of them. 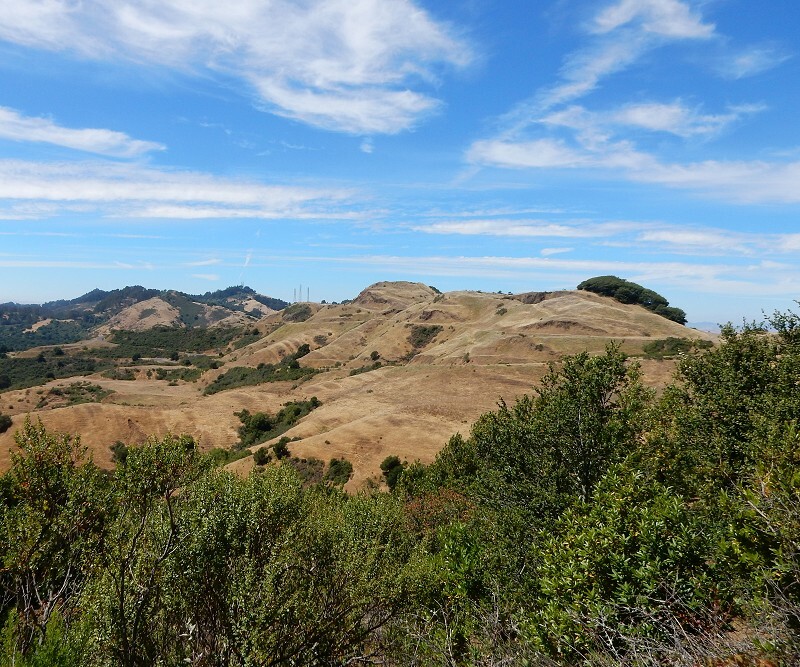 Take the Volcanic Trail left, which leads into the structurally overlying basalt of the Moraga Formation (Tmb). The quarry that carved up these golden hilltops extracted that basalt. In 0.2 miles, at the right edge of this photo, is a road with a cattle gate that exits the park. 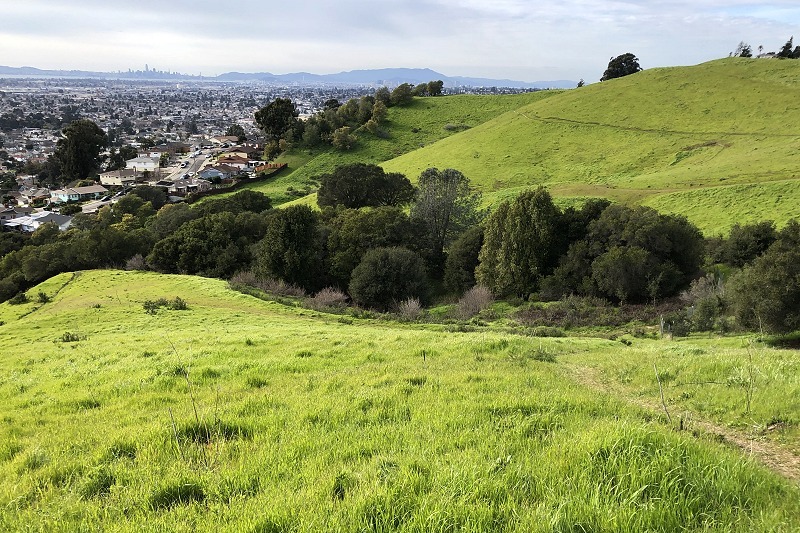 The views change dramatically on the east side of the hills, whether you’re looking to the left up Siesta Valley . . .
. . . or to the right toward Mount Diablo. 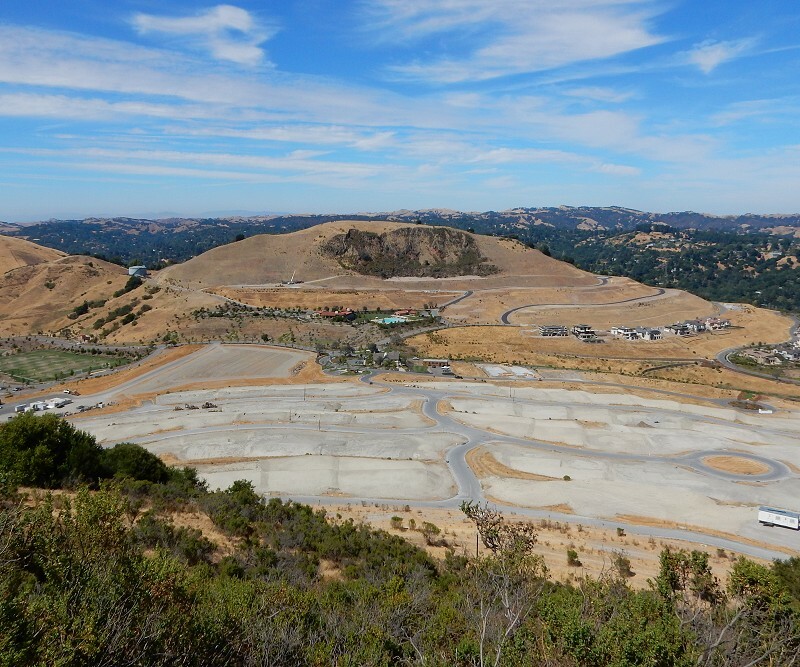 Straight ahead lies the unbuilt Wilder Ranch subdivision of Orinda. The valley it sits in is the continuation of Siesta Valley, and it’s underlain by nonmarine sedimentary rocks of the Siesta Formation. 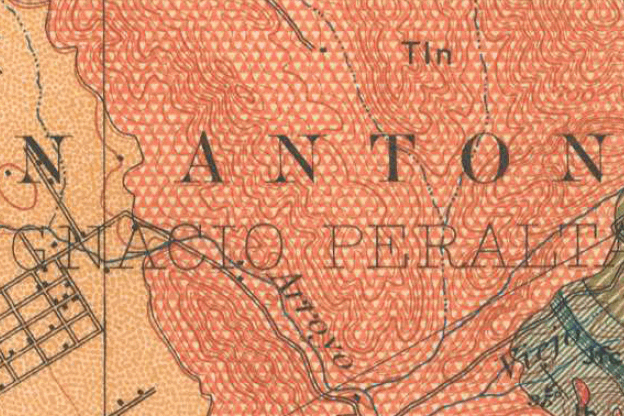 Both valleys owe their shape to the large fold, or syncline (“sloping together”), in the Siesta Formation that’s noted on the geologic map. 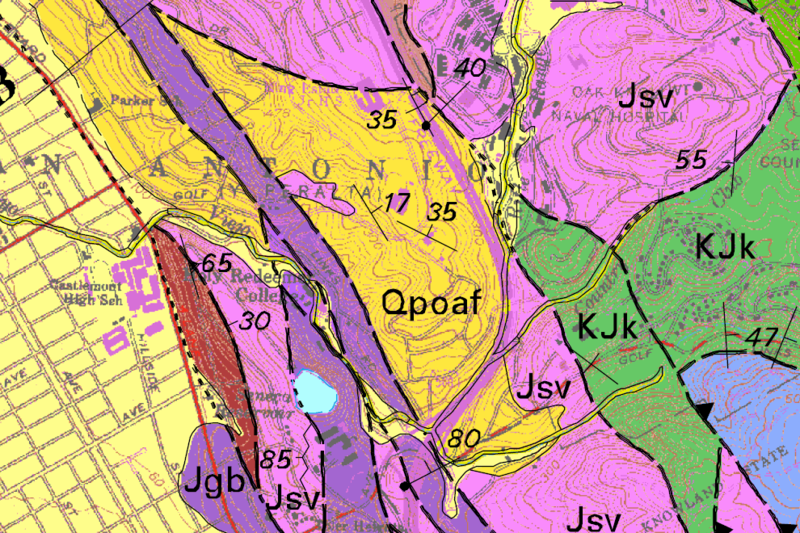 The Moraga Formation basalt is also downfolded by this syncline, and it crops out again in the hill with the quarry scar. 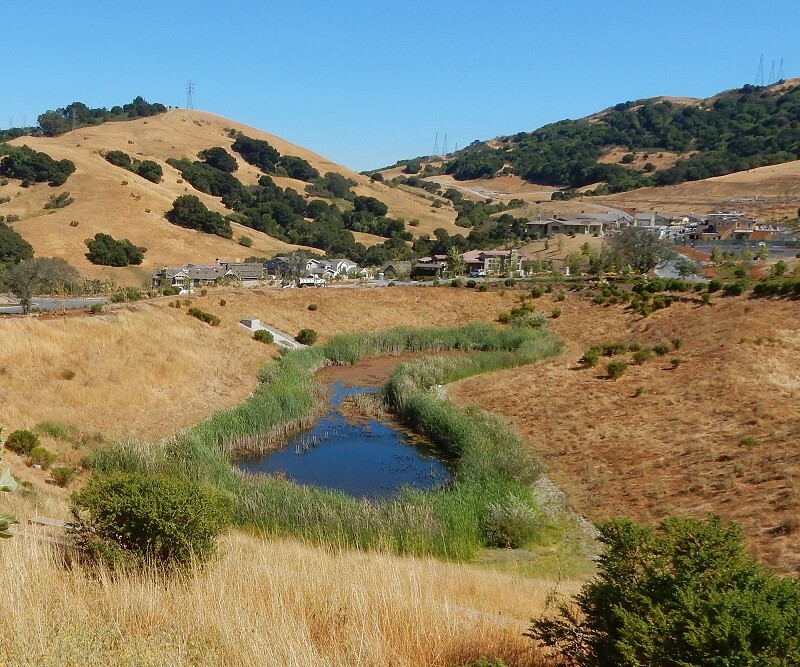 This subdivision looks bleak, but the developers are doing the job right. The lots are gray because they’re sealed with some tough, pliant substance that prevents all dust and weeds. And as you cross, the route takes the dirt road running from the intersection of Wilder and Bigleaf Roads to the big bend in Rabble Road. You’ll pass several vegetated catch basins designed to hold the extra runoff from the new properties. This is another example of the flood-control practices I mentioned last week. 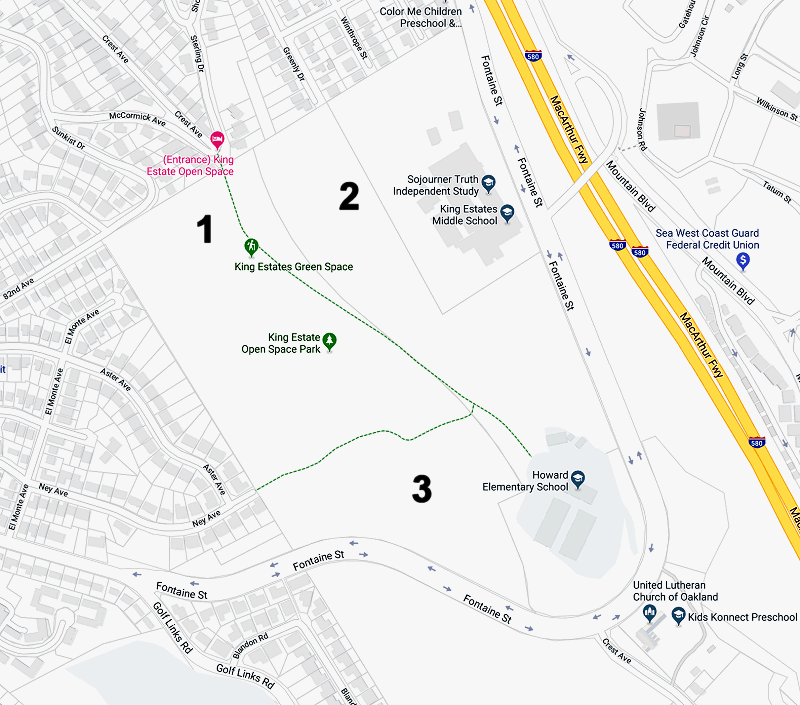 The route goes from Rabble Road to Boeger Ranch Road, but take the straight spur between them and follow it to the end, where a footpath connects with the end of Oak Road. 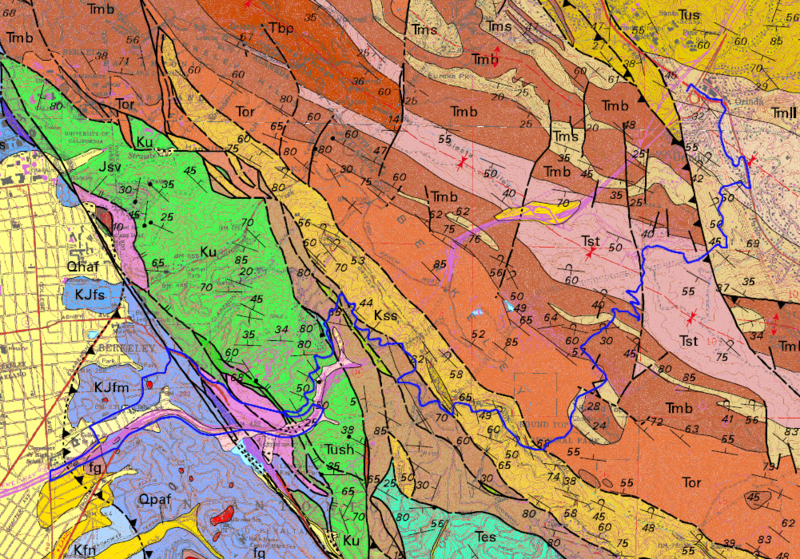 All of this area is mapped as mudstone of the Mulholland Formation, of which I know nothing beyond its (young) age, Miocene and Pliocene. From Oak, take Stein Way down to busy-busy Moraga Way and from there head to the BART station. 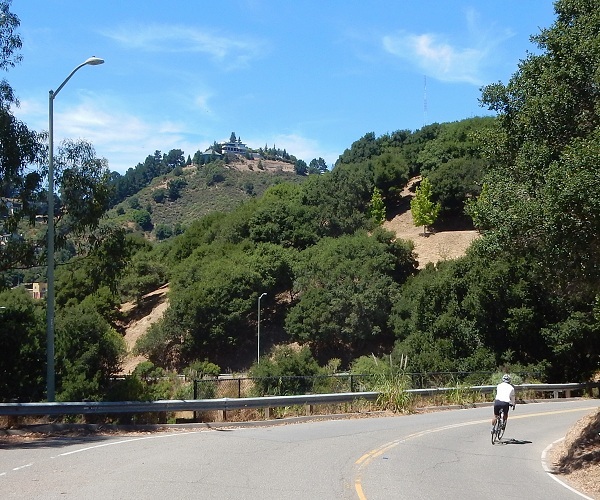 Sidestep as much of Moraga Way as possible by taking Camino Encinas. If time permits, stop for a beer at The Fourth Bore in Theatre Square. If you take this ramble the other way, stop for a beer at Ben & Nick’s. Either way, you’ve earned it. 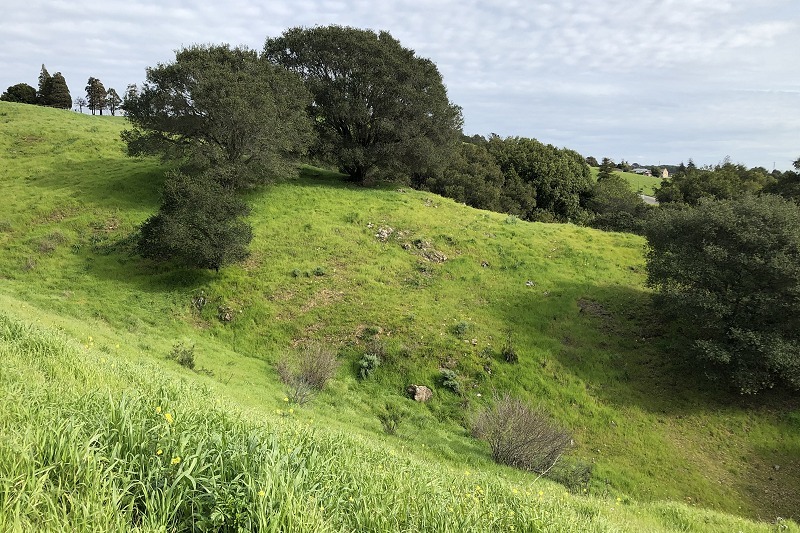 The first time I made this trek, many years ago, I took the northern route: up Claremont Canyon, north on the Skyline Trail, then down through the Lomas Cantadas maze to Camino Pablo. That was work. I’ve hiked up the canyon on Claremont Avenue several times, but the traffic is nerve-racking. 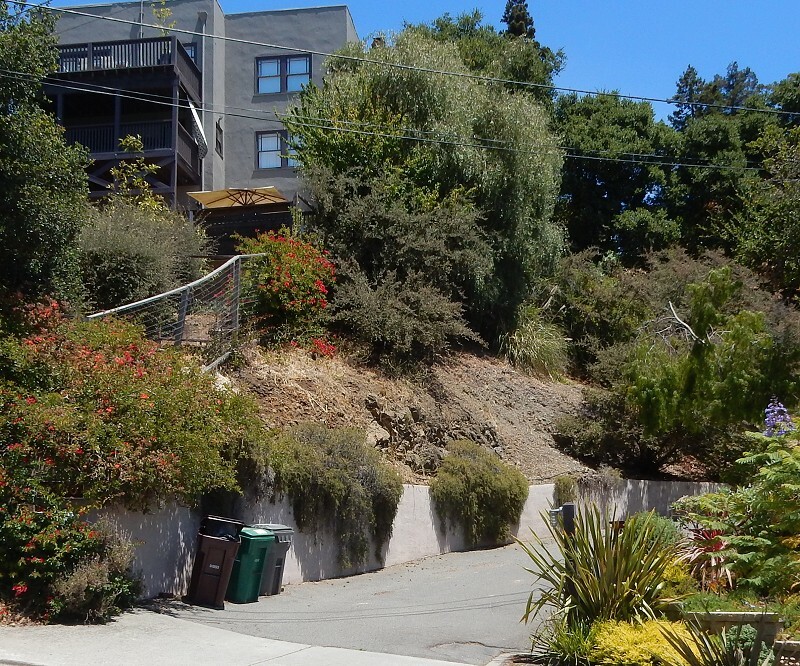 The alternatives, through the Hiller Highlands or Grandview neighborhoods, are steep, sunny trudges. 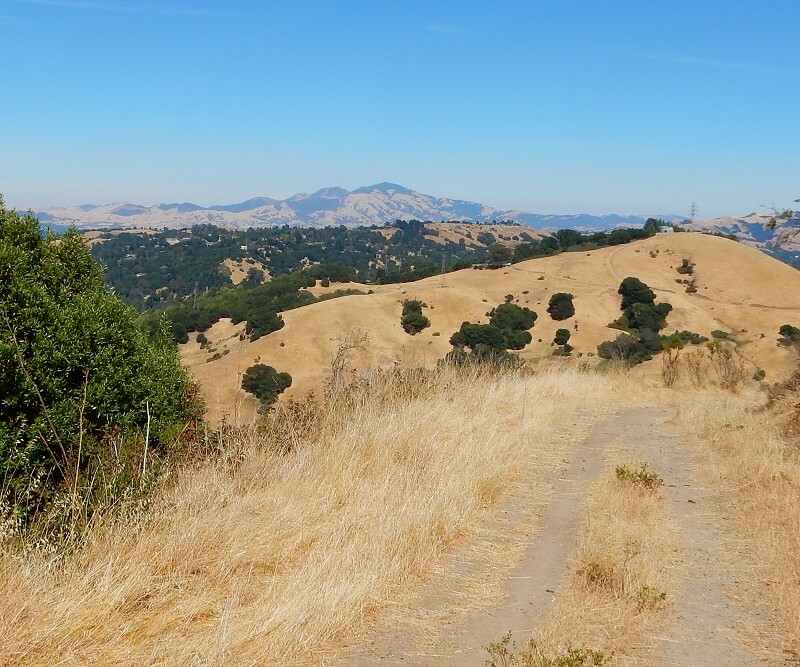 On the Orinda side it would be more fun to descend through the East Bay MUD land from the Skyline Trail (for which you need a hiking permit). I plan to attempt the northern route again when the weather cools. I have a vague scheme for a southern route, too. 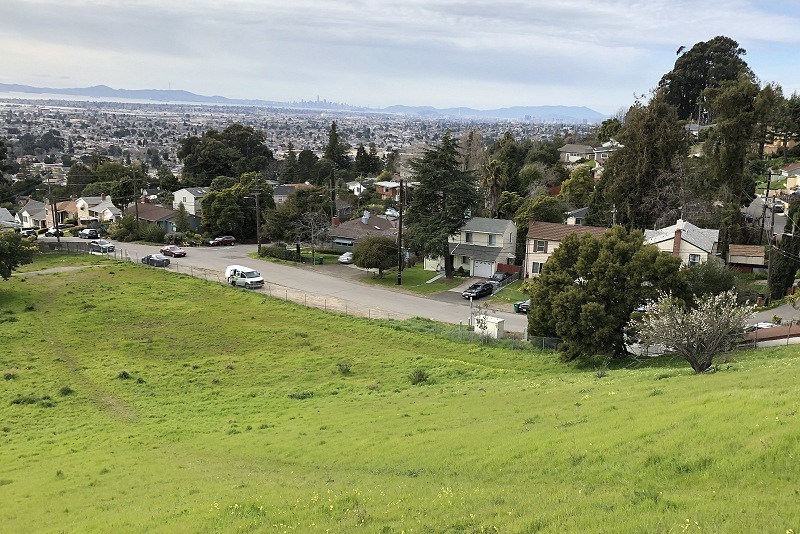 Fairmont Ridge is the grassy upland that forms the backdrop to San Leandro. 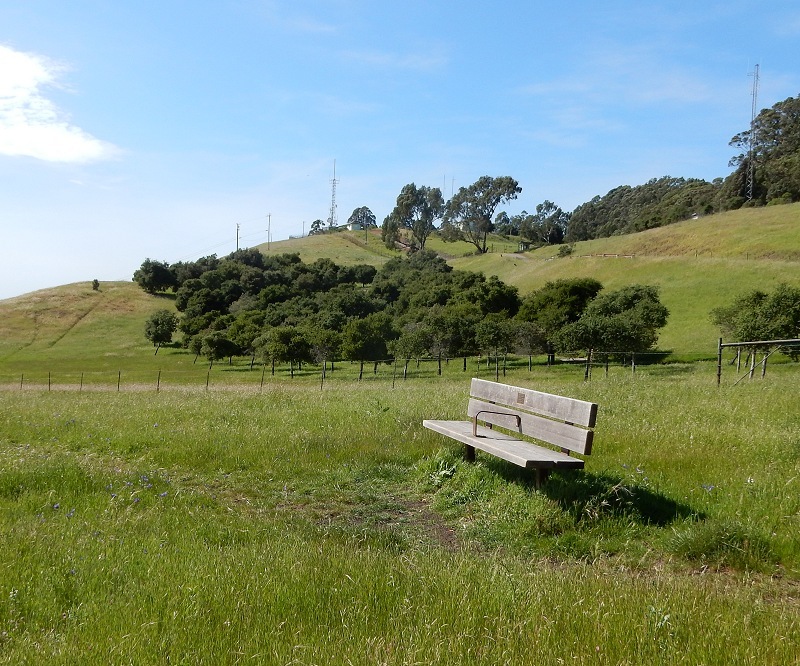 As it happens, East Bay Regional Park District owns much of it as part of Lake Chabot Regional Park. It has some rocks, which I’ll show first, and also some fine views. 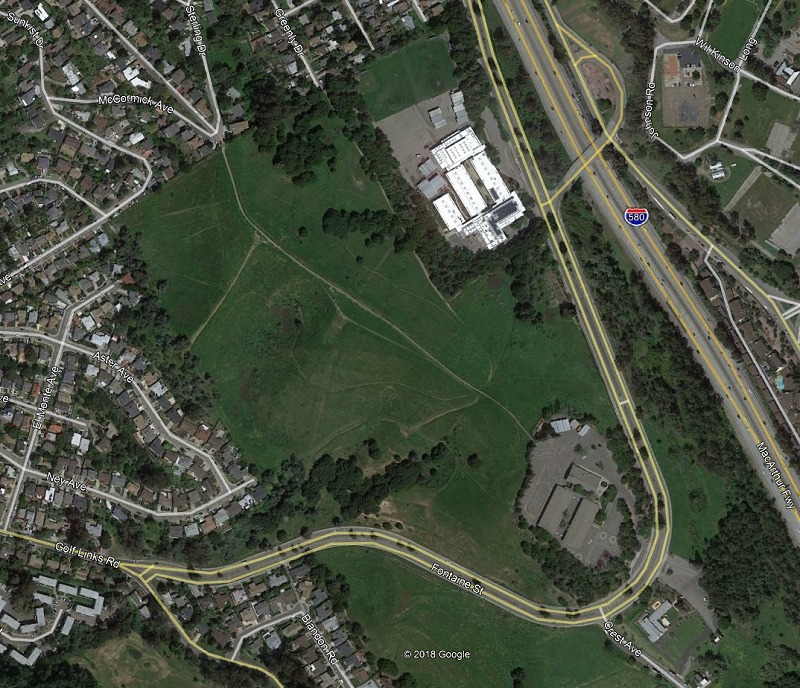 Here’s the aerial view of the ridge from Google. 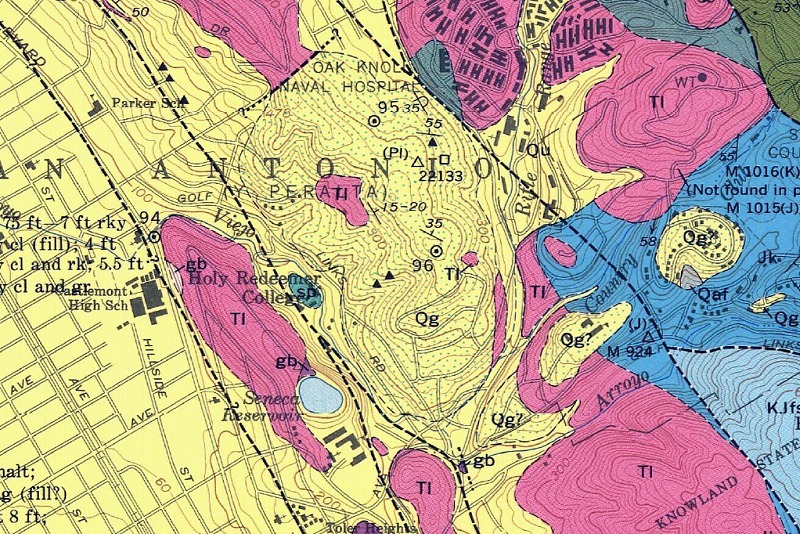 And the geology of the same area is here. 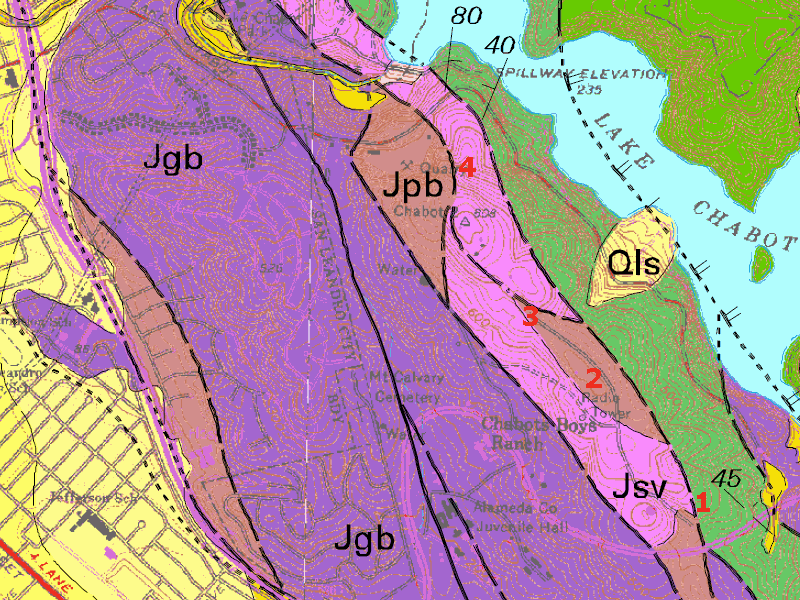 We’ll look at rocks from three different units: the green area is underlain by the Knoxville Formation, a shaly sedimentary unit; the light-brown area labeled Jpb is basaltic lava; and the pink area labeled Jsv is Leona volcanics, which you’re familiar with by now from Oakland. 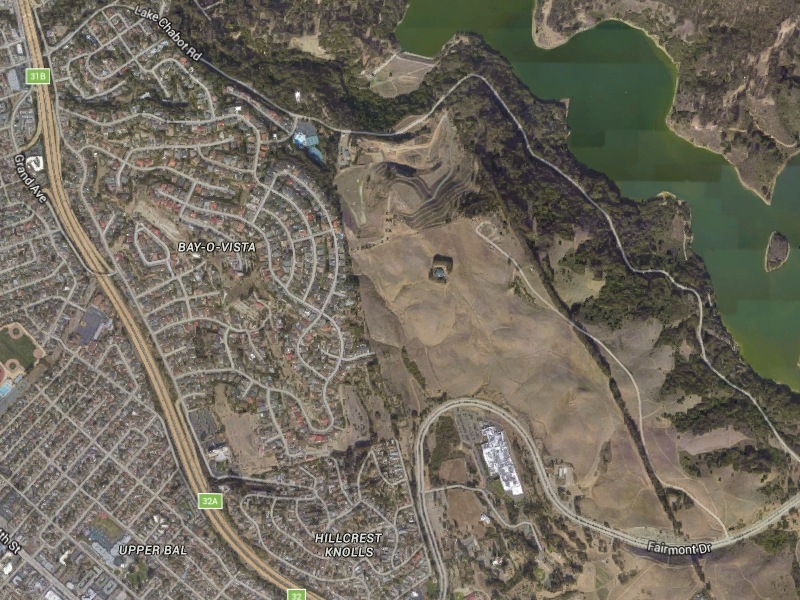 The Knoxville is well exposed around Lake Chabot. 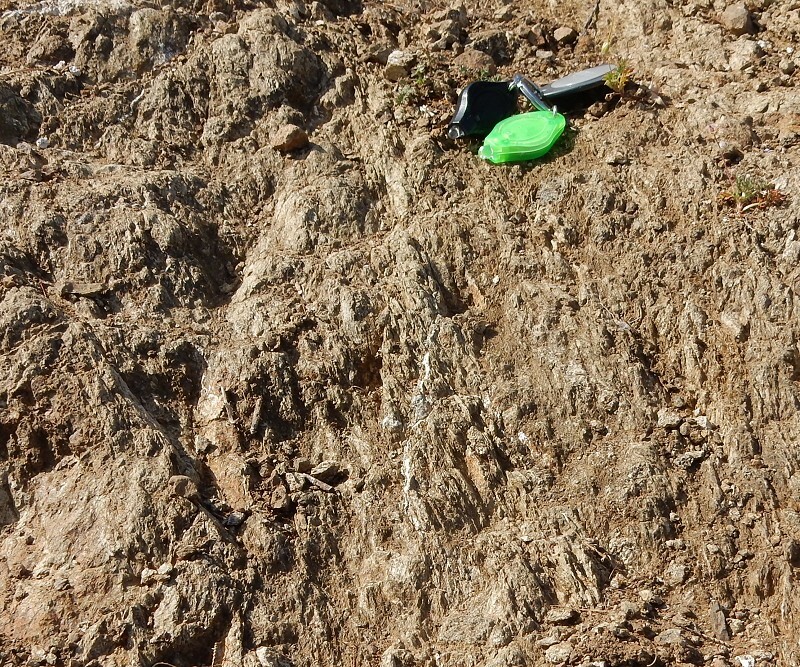 Here, to the east of the access road at locality 1, it appears to be strongly sheared, suggesting that its contact with the structurally underlying Leona and basalt is a fault. This view is facing north, parallel to the contact. The basalt unit is formally described as pillow basalt, the kind of balloon-shaped flows you’d find where lava erupts beneath seawater. 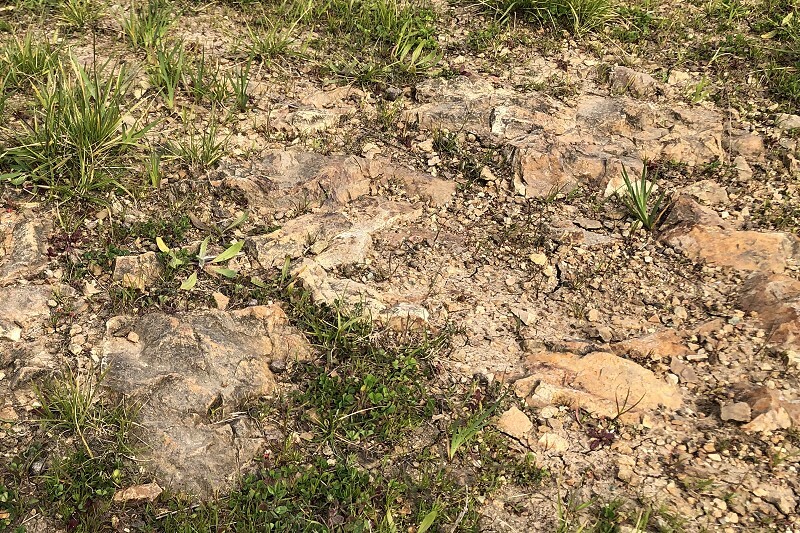 But these rocks have been shoved around a lot since they were erupted in Late Jurassic time, and I have yet to see decent pillow morphology in any exposures. Still, the outcrops, like this one at locality 2, are picturesque. The windbreak of giant, mature eucalyptus is visible in the photo. This is a naturally breezy park, and the line of trees offers some welcome shelter. Across the ridge on the Bay side, there are more outcrops of the basalt. Around locality 3 it’s well displayed. 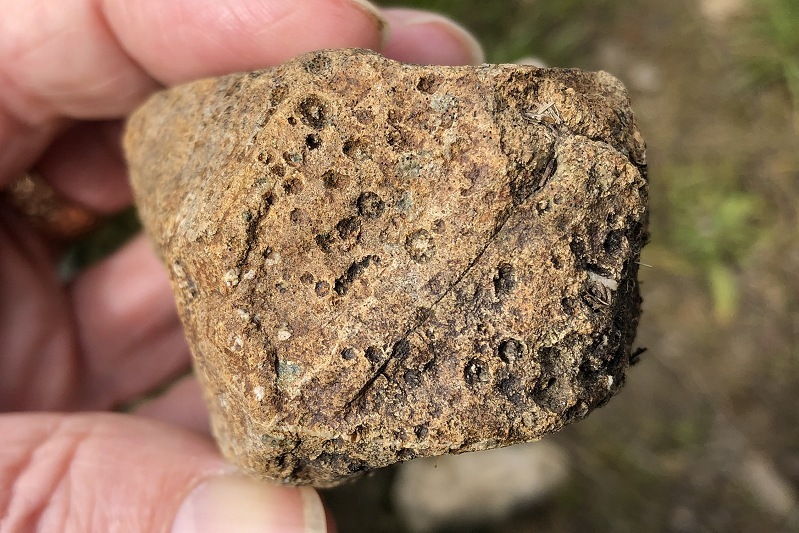 If you pay attention, you’ll see bits of this rock with polished surfaces, or slickensides, on them. 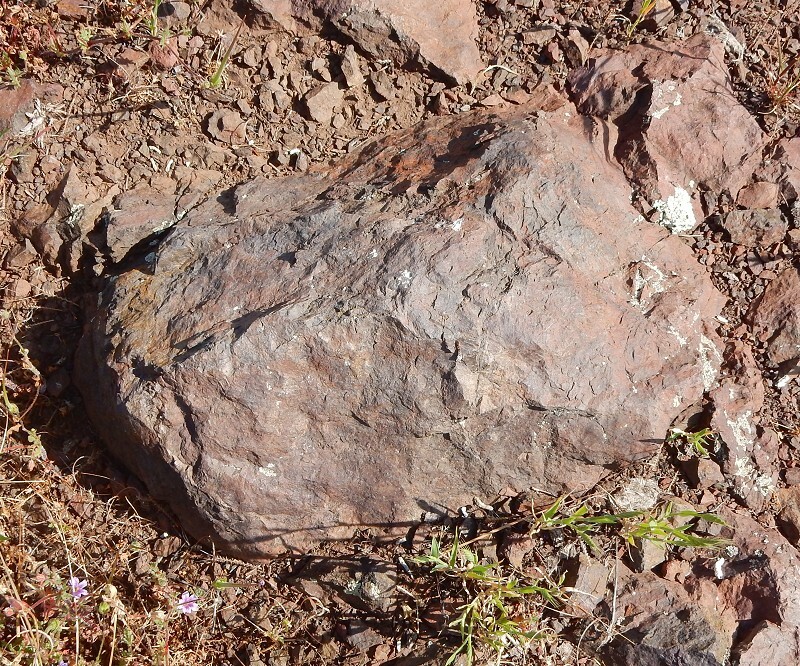 These are caused by motion on faults, which rubs rocks against each other. Here and there, proper outcrops enable us to see that the faults are oriented vertically and parallel to the ridgeline. 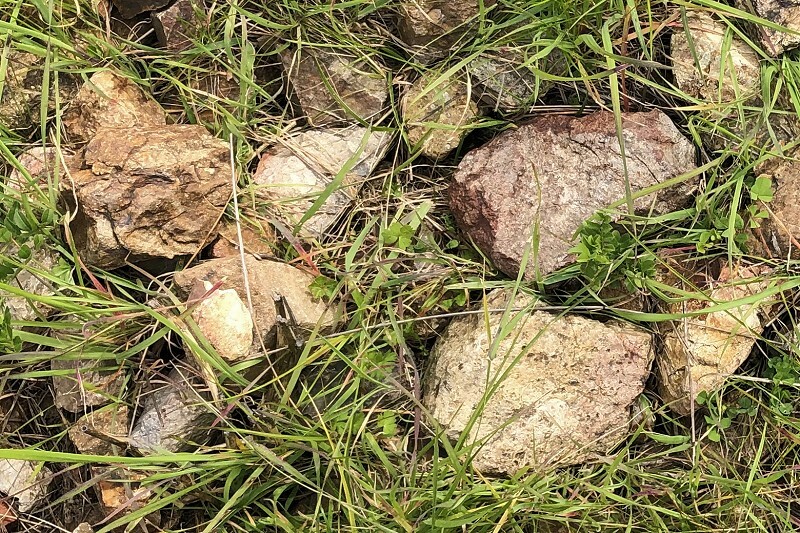 I interpret these as forming recently as these rocks were folded and tilted upright by motion related to the Hayward fault. The peak of Fairmont Ridge is fenced off, but an informal trail leads north along the east side of the fence to locality 4. (Poison oak will very soon make it impassible.) 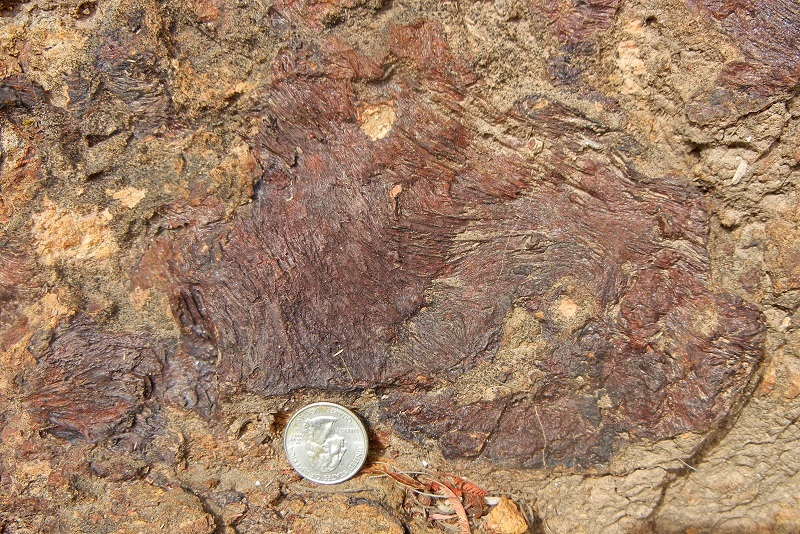 That’s where this typical specimen of Leona volcanics was. But sometimes rocks are just rocks. Lift up your eyes from the hills and sit a spell. 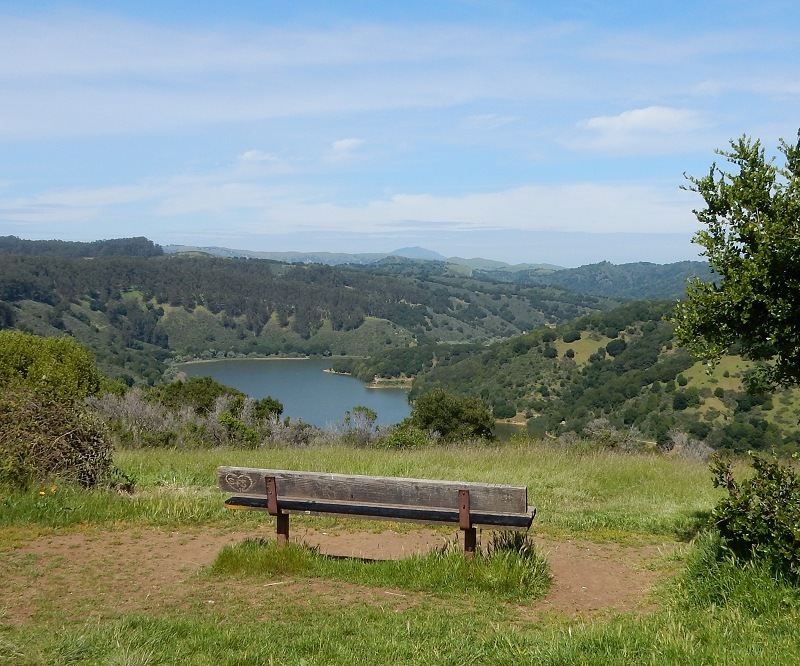 You can gaze upon the Bay side . . .
. . . or over the reservoir toward Mount Diablo. 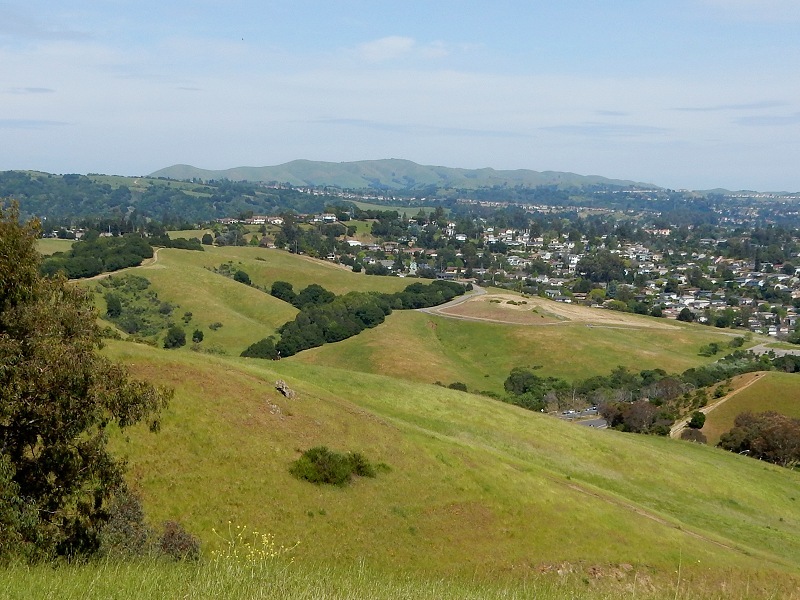 Looking due east is a nice prospect of the ridge known as The Knife, overlooking San Ramon. Its high point is named Wiedemann Hill, elevation 1854 feet, and I have a growing fixation with it.